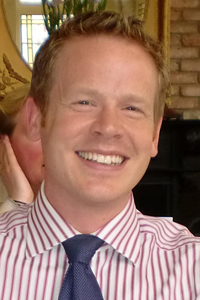 Mr Ben Davis | Consultant Trauma Orthopaedic and Limb Reconstruction Surgeon "www.fracturefixer.co.uk"
Minor pin site infection is to be expected at some point in most patients with external fixators. This should not be viewed as a 'complication'. Many different methods of pin site care have been described, although the medical evidence supporting one method over another is weak. One method has been shown to reduce the time to first pin site infection and the severity of infection should it occur. This is my preferred method of pin site care and therefore is suitable only for patients whose fixators have been applied by the same methodology: Day 1, 2 and 3 Post-operatively: Dressings after surgery are changed on each of the first 3 days. The dressing consists of a square of gauze, folded in half and cut into 2. A split is then cut into the gauze square which is soaked in 70% Alcohol Chlorhexidine Solution (Hydrex). The dressing is placed back on the pin site and the rubber bung pressed down to keep the gauze in place. On Day 3 only, if the pin sites are clean, the dressing is completed by wrapping a figure of 8 gauze roll bandage over two adjacent pin sites to keep the rubber bund pressed down on the pin site. Chlorhexidine is an anti-septic agent, and the alcohol in the solution dehydrates the pin site creating an unfavourable environment for bacterial growth. The pressure of the dressing on the pin site prevents movement of the skin against the fixator pin and all of these prevent infection. Pin sites are cleaned and redressed after every 7 days for wire fixation, or every 10 days for half-pin fixation. The old dressings are removed, the pin site is cleaned with gauze soaked in Hydrex and the pin site redressed. If infection occurs, or is suspected, the pin site should be swabbed, and the patient advised to rest and elevate the limb. These simple methods will settle most minor pin site problems. If the problem is thought to be more serious, oral antibiotics, usually Flucloxacillin should be commenced, and the surgeon should be informed either by the Healthcare Professional or the patient. Serious pin site problems are extremely rare if patients and surgeons look after external fixators properly. Many patients ask about showering and bathing with their fixator. Bathing the fixator is not advisbale. Showering is permitted but patients should remove dressings before-hand, avoid soap etc from washing over the external fixator, and then dry and redress their pin sites immediately after showering. Patients with external fixators benefit enormously from physiotherapy. Weight-bearing status should be clearly indicated by the surgeon and will vary depending on the fixator and what it is being used for. 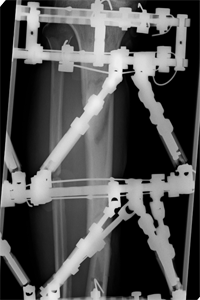 Despite their 'flimsy' appearance, all-wire external fixators are extremely strong, and as a general rule, weight bearing is good for bone healing. Physiotherapy should concentrate on adjacent joint range-of-movement and gait training, including mobilisation of the toes as wire fixation can tether the muscles leading to discomfort and stiffness. If patients develop pin-site irritation (particularly at the ankle), the intensity of physiotherapy should be reduced as it may be the movement of the skin around the pin-site which is a contributory factor. 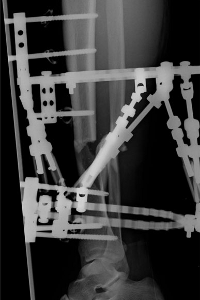 If a patient is undergoing limb lengthening surgery, it must be remembered that it is not just the bone that is being lengthened. As such, physiotherapy is very important to help prevent joint contracture as the muscle and tendons lengthen as well.